Looking around the chip-cluttered table at my three fellow players, I trust no one. I slightly lift the edge of my cards up with one hand – revealing enough of a sneak peek to know what I’m working with – while my other hand pops a cigar in my mouth. The beer-toting cowboy to the right of me pulls out a lighter and with a flick of the wrist summons a flame, reaching across to light my smoke. I give him the thumbs up in approval as he pockets the lighter and continues to throw back his beer. I have to keep an eye on that one. I once again check my cards, comparing them to those in the middle of the table. My hand is good but I can’t give anything away – not to the old woman in the extravagant sunglasses, the bearded gentleman sucking on a coconut-housed cocktail and certainly not to the friendly inebriated cowboy. I take the slowly burning cigar from my mouth and hold it in my right hand as I lift $200 of chips with my left and throw them on the table. Gradually my opponents begin dropping their cards on the table - folding as I hoped they would. I am victorious. Placing my cigar in the mouth of a rubber duck that is sat on the table, I pull out a wad of cash and ‘make it rain’, swiping the bills all over the table. The bearded cocktail connoisseur pulls out a bottle of champagne and passes it to me. I uncork it in a flurry of bubbles, pointing it at my opponents and letting the suds cover them in turn. This is how it feels to be a high roller. The peculiar thing about this experience is that I’m not sat in a luxury Las Vegas casino, but on a plastic chair in the middle of EGX 2018 at the NEC Birmingham, with a VR headset strapped to my face. The mysterious opponents? Just other attendees playing the game on the other side of a separator. I can hear them cursing me out – they clearly don’t realize how nearby I am. I hate gambling. It’s perhaps because of negative personal family experiences or the fact I can’t wrap my head around the concept that people can spend thousands in hopes of winning just once. That’s not to say I haven’t dabbled. As a young teenager I was often scolded in French for starting small poker games which seen my classmates and I gambling anything we could find in our pockets – often batteries, loose change and used stationary. I was good at poker but as I grew older I didn’t succumb to the appeal of playing for real-life money. It’s hard to imagine how this concept works for a modern day online poker game, but actually it provides something special – the enjoyment of playing poker without the monetary consequences – because the driving force is socialization. PokerStars VR sees you playing no-limit hold ’em poker online with others, with each person creating their own avatar and being able to chat in real time with others at the table. Due to the immersive nature of VR, and with the development team’s fine attention to detail, players can pick up on each other’s tells simply by paying close attention to behavior and the movement of their opponents' hands. It’s almost like being in the same room. The realistic nature of the movements is initially very strange as, using the motion controls, you can can control almost every part of your hands – right down to fingers and thumbs. It’s something which takes a while to get used to but once you accept how close to real life the movements are, it almost becomes second nature. Take giving players the thumbs up, for example: you clench your fist using the trigger, then stick out your thumb using the analogue stick of the corresponding hand. Over time it becomes a habit. I could talk about the poker elements of PokerStars VR, but it’s pretty straight forward and in no way the drawing aspect of this game. In reality, the best part of PokerStars VR is the props and customisation. Players can dress their avatars, stream shows in-game and make use of virtuality items and activities such as ordering food and drink, sharing sushi, smoking, and much more. At one point our group summoned a collection of rubber ducks and proceeded to try and see who could successfully throw them into the pool surrounding us (and get them to float). These props provided an extra layer of fun on top of the actual poker game itself and add an extra sense of reality to the game itself (even if it is bizarre). In addition to these props, there are are five exotic virtual reality settings for players to experience: Macau 2050, The Macau Suite, The Showdown Saloon, Monte-Carlo Yacht, and The Void. While I immensely enjoyed my time playing PokerStars VR, there were moments were the immersive nature of the game frightened me . This is potentially because, while the game is currently free and we were playing merely for fun, the team told me they would consider adding a real-money option in the future if players wanted it. It may also partly be because I found myself really enjoying it, wanting to play more games every hand. The enthralling gameplay is great for fun, but when a real gambling and monetary element is added things begin to get dark and complicated. A virtual reality online gambling game could blur the lines between real monetary value and digital currency for those playing. My personal hope is that PokerStars choose to keep their VR title free, only introducing microtransactions for extra props and virtual activities - because that's where the game's strength truly lies. 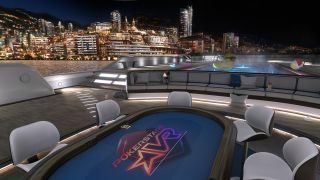 PokerStars VR is currently in closed beta but a commercial launch is planned for late 2018. The title requires an HTC Vive or Oculus Rift headset and tracked motion controllers.